18th Annual friendly "Best Chili" competition to benefit Ecumenical Ministries Inc. 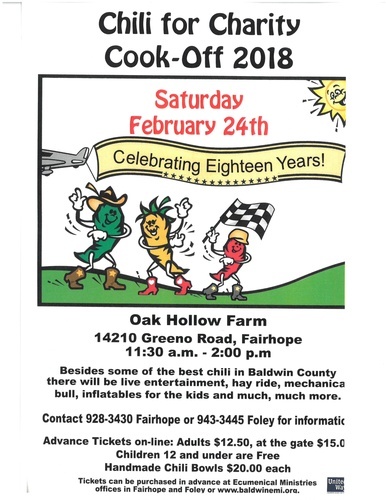 Besides all the chili you can eat, there is live entertainment by Blind Dog Mike and the Howlers and Fairhope High School's Encore Group, a mechanical bull, children's inflatables, a hay ride and a homemade-baked-goods sale. An afternoon of fun for the whole family! $12.50 for adults; at the gate $15. Children 12 and under are Free. Handmade chili bowl $20 each. All applications for teams and sponsorships are able to be downloaded from our webpage.